My Magnolia Quilt made the top eight. The next step in the process is to photograph the eight top and make a group photo of the quilters and submit it to AQS. Then they will evaluate all the groups and decide which ones will be shown in the AQS Show in Grand Rapids. In the mean time, they will most likely be hung in the Columbus Convention and Visitors Center, Columbus, MS during the pilgrimage. Here is a link to the brochure about the dates and what houses will be open this year. I don't have photos of the others but I plan to try to get them on Saturday...until then here is a link to Julia's she was a selectee too. And Keri took photos of a lot of the others and they can be found here. Enjoy the links to their blogs. I had my first finish of the year last night, or really this morning, when during the PTQ meeting I was sewed my label on my magnolia quilt. While I never worked out the tension problems, as a whole I am not as unhappy with the quilt as I was before. I really like the colors and if you don't get too close and look at the tension problems on the back, it is really pretty. It is a wall hanging right??? That means you don't look at the back!! 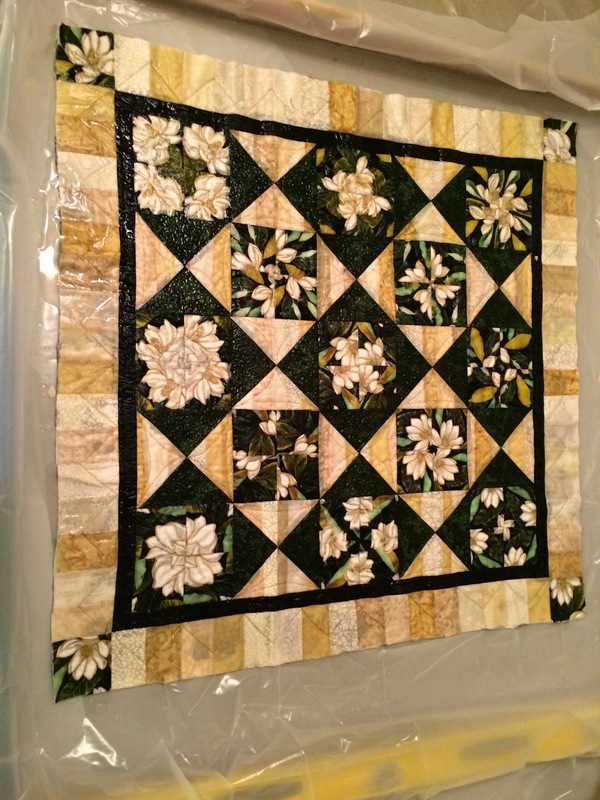 The challenge given the guild was to make a 36 inch by 36 inch quilt (+ or - an inch) that showed a southern magnolia. The quilt had to be bound in the green you see in the photo. The top eight will be chosen to be sent the the AQS Ultimate guild challenge. Then they will look at photos of the top eight and decide if your guild will be invited to participate in the show. To choose the eight, the quilts will be displayed at the MQA meeting in Hattiesburg next weekend. When the blog is published with the minutes from todays meeting, you will be blown away by the variety and workmanship of the quilts. You can click here the link to the blog. I pieced this last summer when a couple of friends and I got together and had a sewing retreat. Sue Harmon and Diane Brown were working on a quiet book for her granddaughter, and I was working on this quilt. I got the inner part done, but didn't bring any black fabric, so on my way home I stopped and bought some and got it the borders on. I then set it aside, hoping my sewing room would be complete before time to quilt it...unfortunately it is not done yet so I quilted it on my small babyloc but it does a great job with piecing it just doesn't do well with the tension for quilting. I named mine "Winds of Change in The Magnolia State" I thought the fractured flowers looked like they had been hit by a big wind. It hangs nice and straight. Here are some closeups of the the quilting. I wrote a bible verse and Mississippi State Flower and Tree - The Magnolia State in the black border. Free motion quilting words is not for the faint of heart. But it is mostly legible. Here is the label that Judy printed for me. If you are not from America, you may not realize that this is the biggest football day of the year for professional football. I have been working on my Ultimate Guild Challenge magnolia quilt and keeping one eye on the game. The game is also important as many of the most innovative ads of the year are aired during the game. So with a daughter who is an art director for an ad firm, I like to watch those too. When making a wall hanging or a quilt for a show, you may want to block your quilt to get it to hang really straight. Life as a Quilter -- Julia Graber: Indecision–The Storm Within told me how she does hers. I my method is pretty much the same. First I lay out some scrap lumber or since I didn't have any around I used some poles from handles of yard tools to make the sides of the "pool." before the water, you can tell it is a little ripply. Then I put some heavy duty plastic to form the inside of the pool. After I put the quilt in the center I pour a gallon, yes I typed gallon, of water over the quilt. I squish the quilt in the water till it is all absorbed. Then I try and make sure everything is nice and flat. I then turned on the ceiling fan and another small fan and pointed it at the quilt in order to dry it out. I expect it will be dry tomorrow. after the water, smoother, but still wet. I will let you know how it is looking. On another note, my dad, Bob Turnage, did have his heart surgery and is doing well. Thanks all who took time to pray for him. I believe in the power of prayer and I know it made a difference. Oh I almost for got to show you the light I bought on my trip to Ikea during Thanksgiving holidays. It really helps if you are sewing at night. Check out the difference. It is a Jansjo.